20 cm x 20 cm filter including pump - Distillers, Brewers, and Wine Makers! ErtrelAlsop’s small scale 20 cm x 20 cm filter including pump is the the perfect addition to any start up distillery, brewery or winery. Our mini-beverage presses come complete with a 110 v, 1/2 horse power, centrifugal pump, and can process from 50 gallons to over 300 gallons! These presses all come with food grade NORYL filter plates, and have an optional dividing head for 2 stage filtration. ErtelAlsop’s mini-beverage filter press consists of a 304 stainless steel frame on casters. The filter carriage also comes supplied with a built-in stainless steel drip collection tray, and hose, to collect any leakage which may occur from the filter. The 20 x 20 cm filters also come stock with food grade NORYL filter plates which can be steam sterilized for easy cleaning. In addition, each filter comes with a1/2 HP pump/motor mounted to the carriage. ErtelAlsop ME filters come equipped with a stainless steel butterfly valve on the pump discharge outlet with a gauge to monitor inlet pressure on the filter. 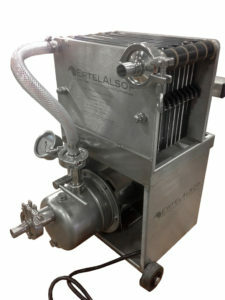 Additionally, the pump has a 1.5 inch sanitary, tri-clamp connection which connects to the filter with reinforced, stainless steel braided hose. This pump may also be used as a transfer pump when not being used to pump fluid into the filter.